Describe your problem. Add as much detail as possible. 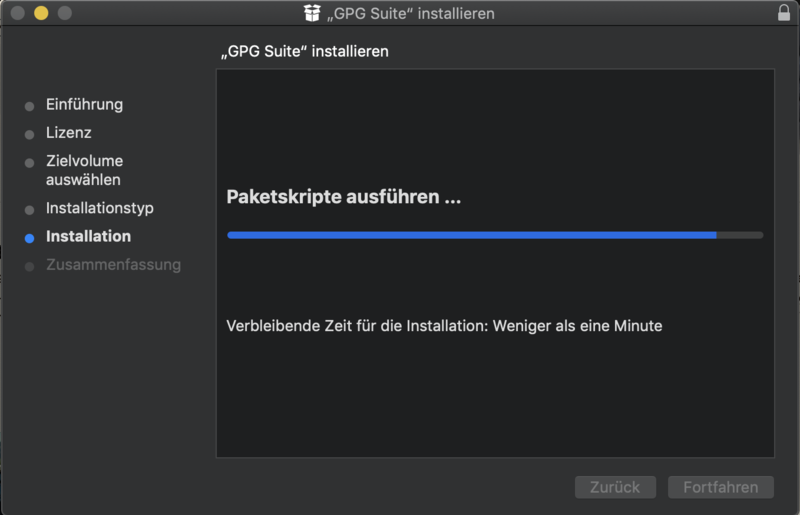 Double clicking the installier, clicking next until installation starts and then the installer hangs and does not complete. What did you expect instead Installations finishes successfully. Describe steps leading to the problem. Double clicking the installier, clicking next until installation starts and then the installer hangs and does not complete. Are you using any other Mail.app plugins? No. The problem that the verification of the installer never finishes is a bug in Apple macOS. We reported this problem in april 2016 as rdar://25903636 which was set to duplicate of rdar://24637789 so the issue was known prior to our report. Please use their feedback form to inform Apple about this problem and ask them kindly to consider investing the time to fix this bug. It may help to add the bug number, so they know which issue you are referring to. Could you restart your mac and retry the install then? Steve closed this discussion on 18 Feb, 2019 07:55 PM.